– You can support Stay-A-While Cat Shelter by shopping at Landmark Lawn & Garden at any of their locations or online. 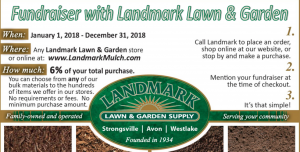 – Landmark Lawn & Garden will donate 6% of all sales! So, stop in, visit online or call in your order and mention Stay-A-While cat shelter!